The Calgary Pro Musica Young Artists Development Program (YADP) is intended to discover, nurture and promote young Calgary musicians. The resources of Calgary Pro Musica (CPM) allow us to offer unique opportunities in individual instruction, performance and career development for emerging musicians in Calgary. We are looking for players with outstanding talent and a serious commitment to developing themselves as well-rounded musicians. scholarship support to the winning individuals or pre-formed ensemble. Scholarships will be used to fund the student’s regular individual instruction. Depending upon the audition results, there will be 2 to 6 students in the program per season. Born in Canada, raised in Africa and educated in Calgary and Houston,Samantha has been praised for creating truly unique and totally engagingmusical experiences. 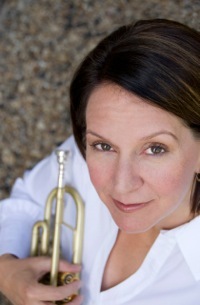 She currently lives in Calgary and is the second trumpetplayer in the Red Deer Symphony. As a Teaching Musician for the National Arts Centre of Canada she has performed her trumpet for over 3000 students a year since 2005. In September 2010 Samantha was appointed the position of education advisor for the Calgary Pro Musica society, one of the leading chamber music presenters in Canada. In February 2010 Samantha joined George Zukerman and Daniel Bolshoy in Nunavut, Canada for an exciting tour of the North. She joined George Zukerman again in April 2011 for a tour of Canada’s Northwest Territories. Her high energy and fun filled performances have made her a crowd favorite for small and large audiences alike. If you would like to know more about Samantha Whelan Kotkas please visit her website at Storyfair.